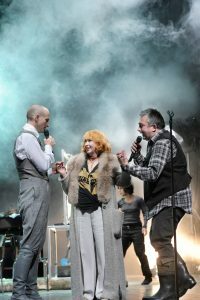 After The Merchant of Venice and Elfriede Jelinek’s Wut, resident director Nicolas Stemann brought Chekhov to the Kammerspiele – The Cherry Orchard premiered in January, 2017. Stemann is not the kind of director who embraces naturalism. In his production of The Merchant of Venice, Shylock never makes an appearance. The director likes to challenge his audience with unusual casting decisions and by changing the text of the play. This time, however, the director leaves the text mostly unchanged and casts every character with one actor. Written in 1905, The Cherry Orchard was Anton Chekhov‘s final play. The dying Chekhov was witnessing a time of great upheaval. There were peasant revolts, the social order was being challenged because the ruling class had ignored the need for change for too long. This passivity greatly contributed to the revolution in 1917. Chekhov wrote his drama as a metaphor for the passivity of society in a time of change and its failure to create a future that is acceptable to everyone. Once upon a time the cherry orchard used to be very profitable. The harvest guaranteed the income of Lyubov Ranyevskaya and her family and secured them a prominent position in society. But over the past years the market for cherries has dwindled and the estate has been losing money. When land owner Ranyevskaya returns to her childhood home to replenish her energy and her finances, she finds herself deep in debt – the estate will have to be auctioned off. Lopakhin, the son of a former serf, offers a solution to save the estate: Cut down the cherry orchard and replace it with holiday homes. To his former masters, this suggestion clearly demonstrates Lopakhin’s lack of culture and is immediately dismissed. The value of the cherry orchard is immaterial. Cutting it down would mean cutting down their place in society, a place that others are also striving to achieve. Nicolas Stemann focuses on identities, but age and, on one occasion gender, are unimportant. Lyubov Ranyevskaya, who returns from Paris to find solace in her home, is meant to be a middle-aged woman with a teenaged daughter, yet is played by Ilse Ritter (born in 1944) with Daniel Lommartzsch (born in 1977) as her brother Gayev. Firs is played by the youngest actor of the cast, Samouil Stoyanov. Thomas Hauser has taken over for Brigitte Hobmeier as Anya’s governess Charlotte. Stemann’s daring casting choices work quite well in this artificial environment of representation. Samouil Stoyanov adds another, quite threatening dimension to his character Firs because he shares his reactionary views not as a doddery old man but as an energetic firebrand. The actors do not often interact with each other but speak into microphones as if they were doing a radio play as the director wants to avoid the sentimental atmosphere of more traditional Chekhov productions. Instead, Stemann places his work in the here and now using the characters as contemporary political figures – Ranyevskaya and her family are the passive establishment, the uninspired neo-liberals are represented by Peter Brombacher‘s tired and subdued Lopakhin, the eternal student Trofimov (Hassan Akkouch) stands for the intellectual who knows the truth but is not a man of action, and Firs is a reactionary who longs for the past because everything was so much easier without freedom. His speeches become quite aggressive and threatening as he turns into the spitting image of a fierce AfD (Alternative for Germany) supporter or any representative of the alt right. Nicolas Stemann has placed Charlotte in the centre of the production. She is not a mere governess, she is a magician, a Romani without a firm identity. After Varya, played by the great but sadly underused Annette Paulmann, states that “only a God can help us now“, Charlotte starts off the second half with her extemporised summary of the first part, which leads to enthusiastic applause. Katrin Nottrodt‘s stage is bare except for a few chairs, microphones, and some electronic equipment and resembles a workshop. Occasionally, the noise of a drill precedes the arrival of logs that are tossed onto the stage. Yet the only prop that features rather prominently is a red velvet curtain that seems rather out of place and moves miraculously whenever Charlotte deems it necessary, only to end up in the dust just like the traditional Chekhov production it might symbolise. The production is in German with English surtitles.